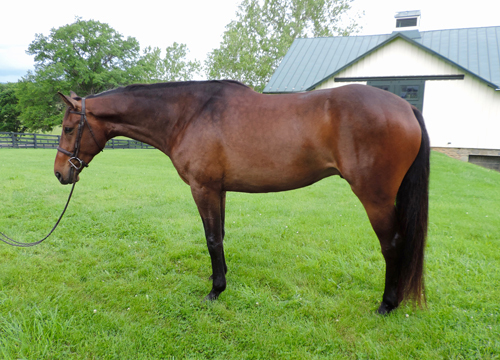 GMS offers top quality horses for sale, specializing in hunters, jumpers, and equitation horses. Please call 540-270-0195 for more information on these or other horses for sale. Elegant, thoughtful and agile youngster with an effortless, powerful jump. Floaty movement as well! Already has plenty of showing experience in Europe under his belt and currently competing successfully in the 6 year olds. Potential for big sport, as he been schooled up to 1.50m. Handsome, scopey and nice movement. Schooling 3'6" easily and ready to show! Just started under saddle and over small courses, he is a true diamond in the rough... the sky's the limit. New video coming soon! Gorgeous young hunter prospect with proven hunter producing bloodlines. Fancy, good mover, good jumper and quiet! Reserve Champion at his first AA show! Currently competing in the 3' Greens and GIP enrolled. Awesome Jr/AO Jumper. Top athlete and very willing. Wonderfully scopey and brave. Has competed up to 1.30m with potential for more. Great Westphalian breeding known for producing hardy and powerful jumpers. Experienced at top venues and winning-minded! Inspires confidence in her riders with her forward engine and tolerance for mistakes. Well-bred to boot! Just started over fences. Bred and born in VA!